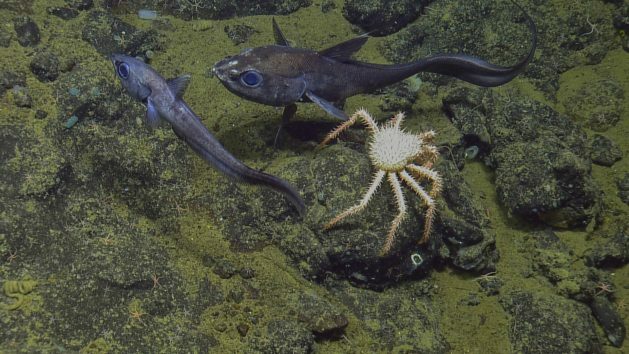 UXBRIDGE, Canada, Dec 5 2018 (IPS) - Despite the deep, cold waters, newly discovered undersea mountains off Canada’s west coast are home to a rich diversity of life. 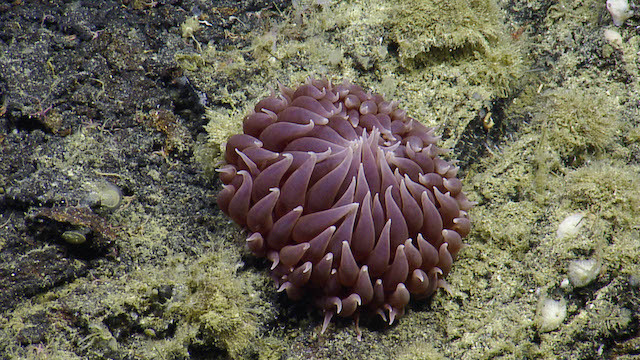 “When we reached a seamount (undersea mountain), it was often like we were entering a forest, only of red tree corals and vase-shaped glass sponges,” said Robert Rangeley, Science Director, Oceana Canada. “These areas were filled with a diversity of other animals including anemones, feather stars, octopuses, lobsters and rockfishes,” said Rangely who led the expedition in July. Oceana, a marine conservation organisation, along with the Haida Nation, an indigenous people, the Federal government department of Fisheries and Oceans Canada, and Ocean Networks Canada were partners in the first in-depth investigation of the recently designated Offshore Pacific Area of Interest. This is a 140,000 square kilometre region 100 to 200 kilometres west of Vancouver Island in the province of British Columbia. The waters in this region are also home to the vast majority of Canada’s known hydrothermal vents, deep-sea hot springs at the bottom of the sea floor. As seawater meets the Earth’s molten magma it gets superheated and rises up through holes or vents in the sea floor carrying with it minerals leached from the crustal rock below forming bizarre chimney-like structures. These vents are home to strange forms of life that thrive in a toxic chemical soup where temperatures can reach 350 degrees C.
The expedition spent 16 days on the water and discovered six new seamounts with ancient and fragile coral forests and potentially new species. Even scientists who have visited seamounts on other parts of the world were blown away by the abundance and diversity of life found Rangely told IPS. The expedition team also found lost fishing gear on some of the seamounts. This gear entangles marine life and destroys fragile and slow growing corals and sponges. Seamounts are often targeted by fishing vessels because they attract an abundance of fish. The damage wasn’t from bottom-trawling vessels that scrape along the seafloor but from long-line fishing. The Cobb seamount just outside of Canada’s Exclusive Economic Zone (EEZ) has been destroyed by fishing he said. Seamounts need protection to provide refuge for marine life and Oceana wants to see all of Canada’s seamounts closed to bottom contact fishing Rangely said. Fishing can still continue away from seamounts, and will benefit from the closures. When seamounts are protected from fishing or resource extraction, it increases the quantities of fish outside the area in what’s known as a ‘spillover effect’. Canada is working to create a new marine protected area (MPA) for most of the 140,000 sq km Offshore Pacific Area of Interest. Half the region would be closed to fishing to protect seamounts and hydrothermal vents. The new MPA may be officially in place in 2020 to help Canada get close to its United Nations Convention of Biodiversity commitment of protecting 10 percent of its marine and coastal areas by 2020. Canada had protected less than one percent by 2017. However, the current government is rapidly ramping up the number of protected areas but conservationists say these protections are too weak and allow fishing or resource extraction. For example a near 50,000 square kilometre marine refuge east of Newfoundland on Canada’s Atlantic coast is off limits to fishing was just opened to allow drilling for oil and gas. Canada is also scrambling to manage its fish stocks that have seen years of steady decline. Just a third of the nearly 200 stocks are considered healthy, according to a 2018 audit report by Oceana. Canada is a major fish and seafood exporter, with exports reaching C$6.9 billion in 2017. After a decade of deep cutbacks by a previous government, Canada’s fisheries department under the Trudeau government is struggling to catch up. Most of the 26 critically endangered stocks do not have rebuilding plans in place the Oceana report found. Last week the Canadian government announced $107.4 million over five years for rebuilding and assessments of fish stocks across Canada. In a statement Oceana Canada’s Executive Director, Josh Laughren called this a critical investment addressing the urgent challenge of rebuilding depleted fisheries and rebuilding abundance. The first global Sustainable Blue Economy Conference took place in Nairobi, Kenya from Nov. 26 to 28 and was co-hosted with Canada and Japan. Participants from 150 countries around the world gathered to learn how to build a blue economy.